Built around AD70 this is the most preserved and stunning Roman Amphitheater in the world! A true marvel of ancient engineering perfection. It is the pride of the Nîmes inhabitants. Several time per year the arena is holding a lot events, music concert, Roman games etc… it has been a popular tourist spot for decades; the heritage site speaks volumes of how majestic Rome must have been and stands tall as an architectural wonder. This complex is undoubtedly one of the seven wonders of the ancient world and acts as a doorway to past. You could easily visit the whole monument with an interactive audio guide (made in 8 languages) that will take you on a ride through time and space. Not to miss!!! Built around 12 BC this is an outstandingly preserved Roman Temple and a splendid work of Roman architecture, and religion. Only one of the kind! What makes the temple a must visit, apart from its great popularity and images floating all over the internet and in books, is how this temple says a lot about Roman Culture, religion and heritage. The remarkable Maison Carrée, stands 26 metres long by 15 metres wide and 15 metres high. Located few kilometers away from Nîmes, this gigantic Roman aqueduct will leave you speechless. The bridge measures an astounding 48.77m in height, has been constructed in three levels. There is much debate on when the bridge was originally constructed, few archeologists argue over periods of construction being in between 20BC but few have estimated it to be in between 40AD to 60AD. The mighty bridge crosses the fast flowing river Gardon, located near Nimes in the south of France. 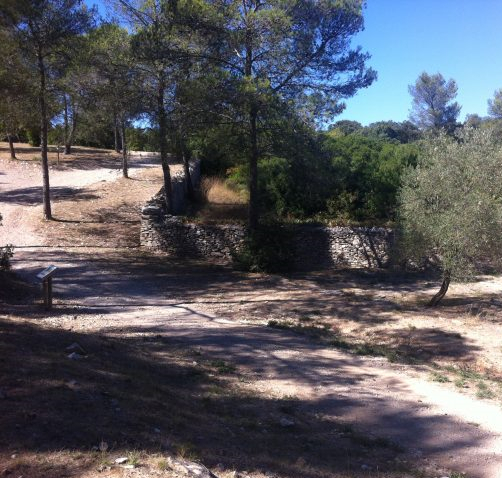 It is also possible to have a walk around the Pont du Gard, there is several easy tracks to follow in the forest and some of them will even lead you to breath taking view over the building. Located at the top of the boulevard Jean Jaures, Le Jardin de la Fontaine is an outstanding public garden that were created in 1745, it is also one of the oldest city park in Europe. Bridges, water, Roman temple, Roman tower, canals, statues and botanical garden are the main highlights. Designed by JP Mareschal the military engineer of King Louis XV in the 18th century, le Jardin de la Fontaine was build up next to an ancient spring discovered by the Gauls. The remains of Roman baths dated from the Emperor Augustus (around 27 BCE) were then discovered on the site. A magnificent walk into this very romantic garden will lead you to the Tour Magne, a stunning roman watchtower situated at the top of the hill. Dated from 15 BC The Tour Magne was a part of the former fortified ramparts that were literally surrounding the city of Nîmes. In the begging, when Nîmes was just created, the Tour Magne was much smaller than now and it was constructed on this hill, as a part of the ramparts, because it is the highest point of the city. You can buy a ticket to get on top of this 92ft high monuments to get a breathtaking view over the city and until the Mediterranean see when the sky is clear. Located in the city of Nîmes, at the top of the boulevard Jean Jaurès, in the Garden “Le Jardin de la Fontaine”, the enigmatic and romantic ruins of the Temple of Diane are something you must see. To access this monument you will have to go to the West side of the garden, just nearby the West gate. Dated from the very early Roman era, the exact purpose of this temple and the exact date when it was build up remain quite unknown. Named after the Emperor Augustus, this one of remaining Roman gateways from the old fortified ramparts of the city. This one is much bigger than the “Porte de France”, it displays several ruins and a beautiful bronze statue of the Emperor Augustus. A Roman style Catholic cathedral dedicated to the Virgin Mary and to the local saint Castor of Apt. Designed by the king Louis 15th architect Jacques Papot, this fort was built up in 1700. It became a prison in the 18th century until 1991 to finally become a University in 1995. One of remaining Roman gateways from the old fortified ramparts of the city. A Modern Art Museum designed by Norman Foster with several modern art galleries, a library and a restaurant located on the top where you can get a nice lunch with a view over the roofs of the city. Located next to the arena, this under construction museum will be dedicated to the Roman History. It will be biggest and most prestigious museum of this kind in the entire region. Its architecture will be matching and dialoguing with the Arena playing with a contrast between materials and shapes. It should be open in 2017. Closed until 2018, this museum have one of the larger classical antiquities and gallo roman object collection in Europe. It seems that the team is working on the Musée de la romanitée project. However the Natural History section locate in the same building still open. Located Place aux Herbes, behind the Cathédrale Notre-Dame-Et-Saint-Castor, this museum is located in the former bishop palace that were build up in the 17th century. 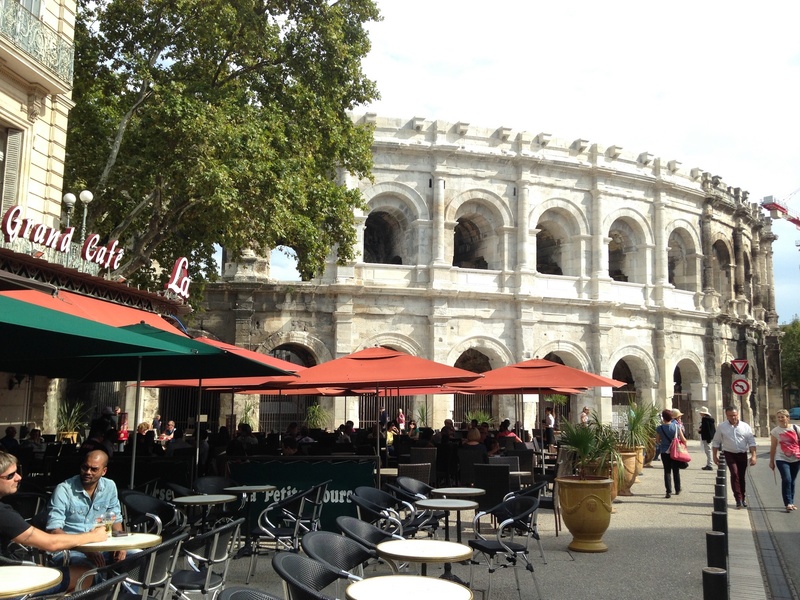 It deals with the History of Nîmes from the Middle ages until the 20th century. You will see several collections about the industry of textile in the 18th and 19th century, interesting information about the origin and the history of the Denim Jean’s fabric and much more. A museum dedicated to bullfighting. 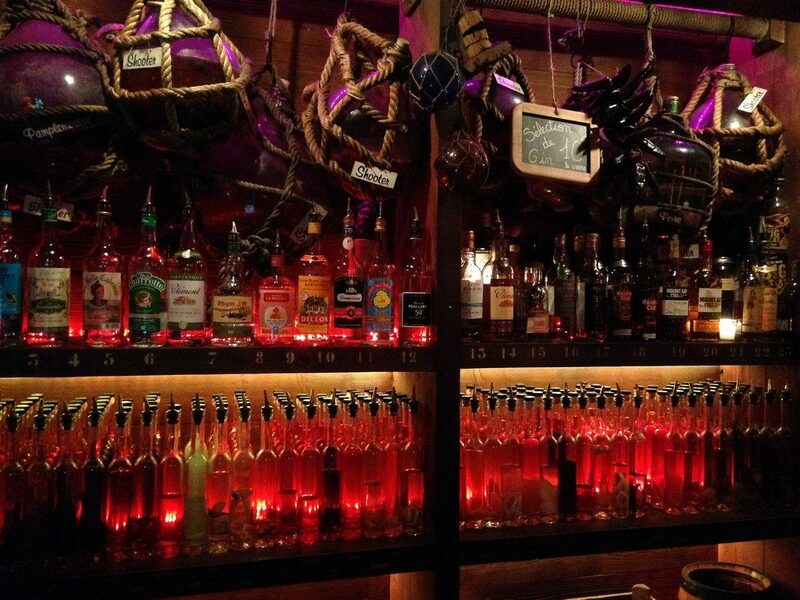 It includes an outstanding collection of torero costumes, painting, stuffed bull heads and much more. This is a must for any fan of Corrida or anybody who wish to understand about this local tradition coming from Spain. A real institution in Nîmes, this well-organized yet vibrant market is where you want to go if you love discovering local specialties and want to get a real variety some fresh ingredients. There you will find baked goods, fresh fish, spices, vegetables, meat and plenty of local food such as olives, tapenade, sun dried tomatoes, the delicious local bouchées de Nîmes and much more! This market is certified with the label “Qualité Sud de France”, which means all the products are strictly seasonal products. There you will not find strawberries in winter or apricot in spring season. You will find a lot of local products often made by small local companies and artisans. Quality over quantity for this local and fun market. Build up in the 16th century this big square is located on the top of the Avenue Feucheres and also nearby the Arena. The square is spreading over 3 hectares and it display in the center a gorgeous marble fountain made of allegoric sculptures representing the city of Nîmes. This square was entirely refurbish in 2012. Its lighting looks totally stunning at night. This is a great spot for walking around and having a break in the middle of the city. Surrounded by cafes, this elegant square display an old clock tower built up in 1752. Located at the beginning of the Boulevard Vicor Hugo the square display a modern style fountain with 2 big heads facing each other which represent the God Nemausus and the source Nemausa. The place d’Assas was remodelled by Martial Raysse 1986. You will also find some cafes and restaurant on Victor Hugo side of the square. In this very gorgeous square located between the boulevard Victor Hugo and the rue de l’Aspic, you will see a bronze crocodile sitting on a fountain (designed by Martial Raysse) and right in the middle of the square a massive and tall palm tree. You will also notice the Nimes coat of arms nailed on paved ground… It looks and sounds like the South, surrounded by colorful houses, restaurants and cafes displaying their peaceful terrace this is where you want to take the time to seat and enjoy a cup of coffee. However don’t really waste your time ordering food in the surrounding restaurant, they are just average. 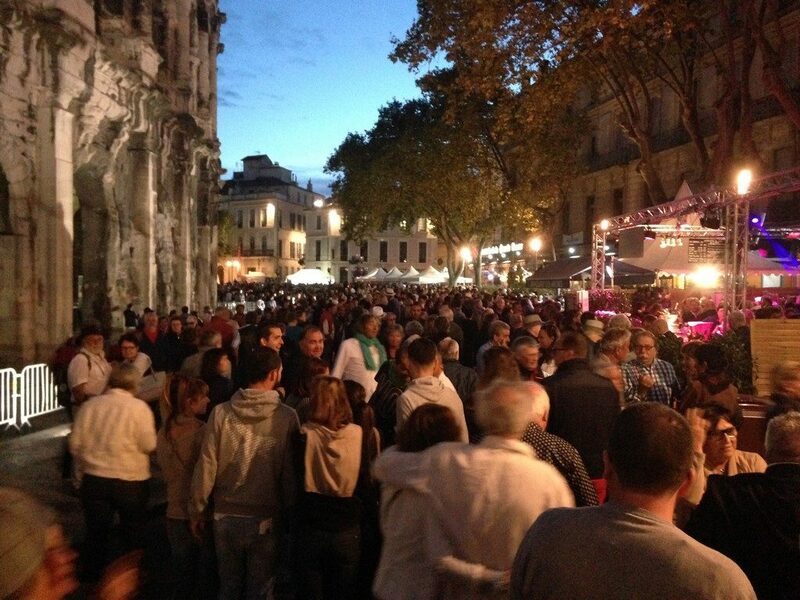 Notice the Place du Marche is outstandingly crowded and fun during the Feria de Pentecote and the Feria des Vendanges, you will then find a multitude of bodegas in the small surrounding streets. Named after the emperor Antonin, from whom the family was from Nîmes, this small square is located at the top of the Quaies de la fontaine. It display in the center a statue of the Emperor Antonin. On the East side of the pedestal we can read the following in Latin Language “SENATVS POPVLVSQVE NEMAVSENSIS” which mean “The senate and the people of Nîmes”. On the West side of the pedestal we can read the following dedication that partially take imperial titulature “IMP•CAES•T•AELIO•HADRIANO•ANTONINO•AVG•PIO, P•P, NEM•ORIVNDO, or IMPERATOR•CAESAR•TITVS•ÆLIVS•HADRIANVS•ANTONINVS•AUGVSTVS•PIVS, PONTIFEX•MAXIMVS, NEMAVSVS•ORIVNDO”. A popular garden and park located on one of the hills of the City. Nothing fancy or very touristic there, just a lot of green space to have a walk and breath some fresh air. There you will also find some petanque court, some playground for children and a planetarium. The biggest natural outdoor trail for those who love running and burning calories! All green, with small forest and different levels of difficulties.